Posted October 6th, 2013 by David Porter & filed under General, Hot Topics, Social. Is Apple Down to Its Core Now? 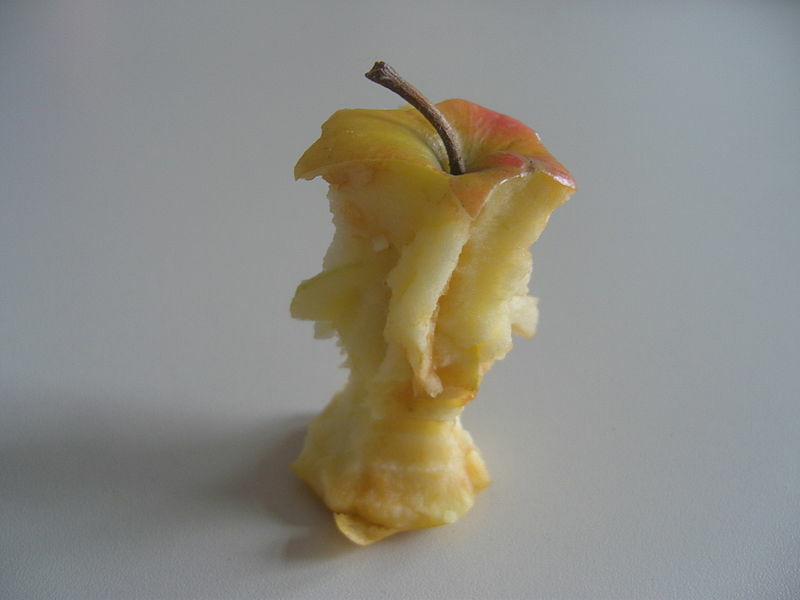 Is Apple becoming a maggot-infested fruit? Is a great leader essential to success? Does the widespread view that Apple will never again be quite the same following the death of the visionary power that drove it hold water? Steve Jobs, the innovative, iconic genius behind Apple died on 5 October 2011, since then so much has happened. And above all, people are still talking about his company, his gadgets, his ruthlessness and whether Apple are doomed to follow Blackberry anytime soon. The speculation is that Apple’s head-start in the innovation race is being eroded by newer, more hungry and aggressive contenders. Apple could be like Tesco and Manchester United FC, both giants unable to adapt to a new regime after the old glorious one ends. MBF Blogs take a quick sniff of the prevailing wind to see what people are saying about Steve Jobs and Apple now and in the light of all the new devices and promises and expectations and share prices and all…..
Time, Technology & Media has a piece by Sam Gustin headed: Two Years After Steve Jobs’ Death, Is Apple a Different Company? In fact, Cook may be right about incrementalism. The invention of the car was ground-breaking revolutionary; thereafter improvements have been relatively minor. After years of breath-taking innovation that changed the world (iPods in 2001, iPhones in 2007, and the iPad in 2010), the Cook line that incrementally holding/increasing market share is actually innovation holds little water for Gustin. Cook’s assertion that ‘it’s making things better’ may not be the answer when people demand such rapid newness. Elie Chahine’s blog begins with similar wording, and then as you read on you find it’s so similar it’s almost exactly the same! Mylewski evaluates Cook’s performance by reminding everyone that he wasn’t just ‘thrust into the top job with no preparation’, but had been left in charge of “Apple’s day to day operations’ three times before Jobs died, while his health meant he couldn’t be the de facto CEO. Quite perceptively, Fung thinks Cook’s memo eases the pressure of considering everything through ‘the prism of Jobs, his thoughts and approval’. He is being transformed from ‘a baseline’ into a ‘cultural guide’, which is liberating for Apple. The whole drift is that Apple is still an investment not to be written off by any means, that for various political, personal and fiscal reasons rather than technogical, it will rise again. CNBC also broadcast an assessment from the stock market perspective along with rival manufacturers’ work and commentator Jon Ffort concluded iWatch ‘will be a killer product’ and Apple could still be top. They wrapped it under the label, ‘iConomy’ confirming the significance of the concept. Different era, yes, but it is the ‘no new product categories’ that kills it for Sparks. So, what do YOU think? Steady decline now for Apple or a real change of emphasis?